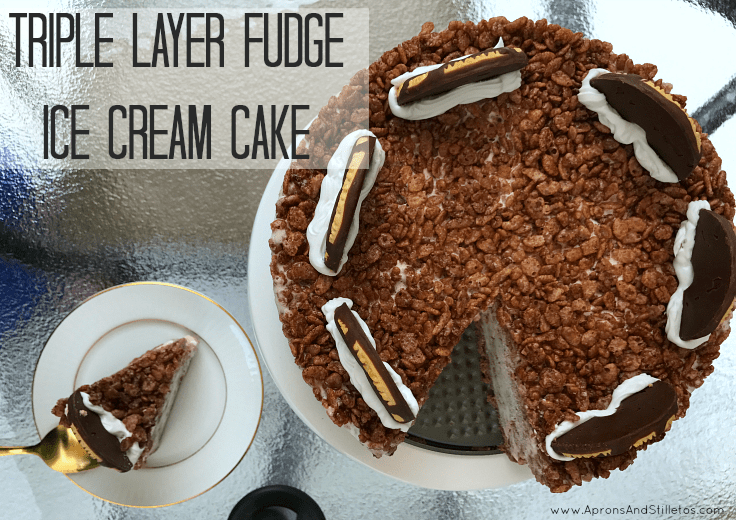 The creation of this yummy Triple Layer Fudge Ice Cream Cake recipe is a sponsored post. All opinions are mine alone. Today was my children’s last day of school and I wanted to kick it off with a bang. I didn’t want to give them time to start bickering so I planned games and made a sweet summer dessert to surprise them. When they came in the door they were excited that school was over. I told them to grab a quick lunch and meet me at the patio table. I had scrabble set up and this yummy Triple Layer Fudge Ice Cream Cake, ready to go. The cake only requires five ingredients and is easy to make. The main ingredients are Keebler Fudge Stripes Original cookies, vanilla ice cream and Kellogg’s Cocoa Krispies Cereal. 1. Set the ice cream on the counter to soften. 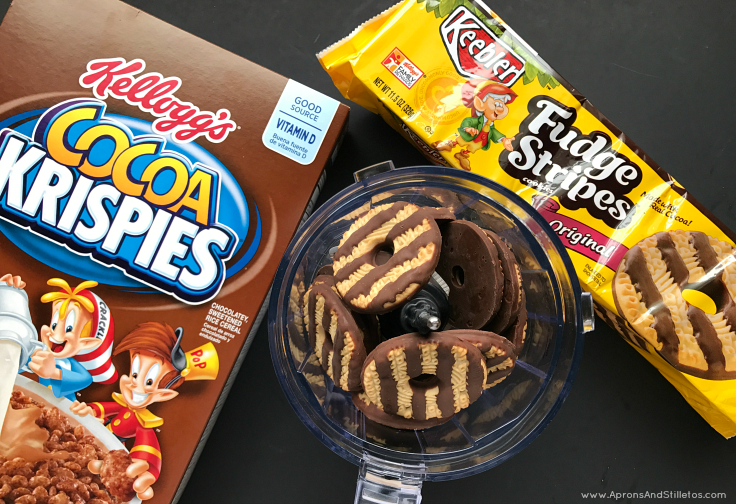 Pulse 12 Keebler Fudge Stripes Original cookies in a food processor with 1 tbsp of peanut butter. 2. Take the cookie mix and press it down into a small springform pan. 3. 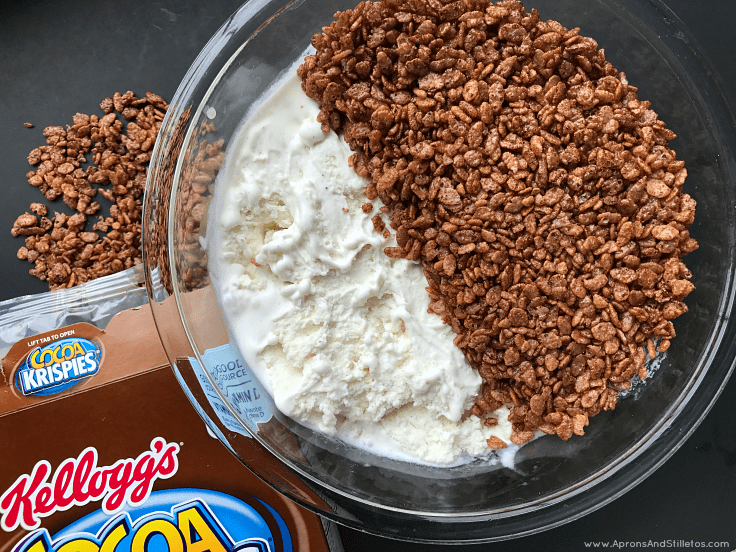 Scoop the softened ice cream into a large bowl and fold in 1 cup of Kellogg’s Cocoa Krispies Cereal. 4. Pour the ice cream and cereal into the springform pan and smooth. 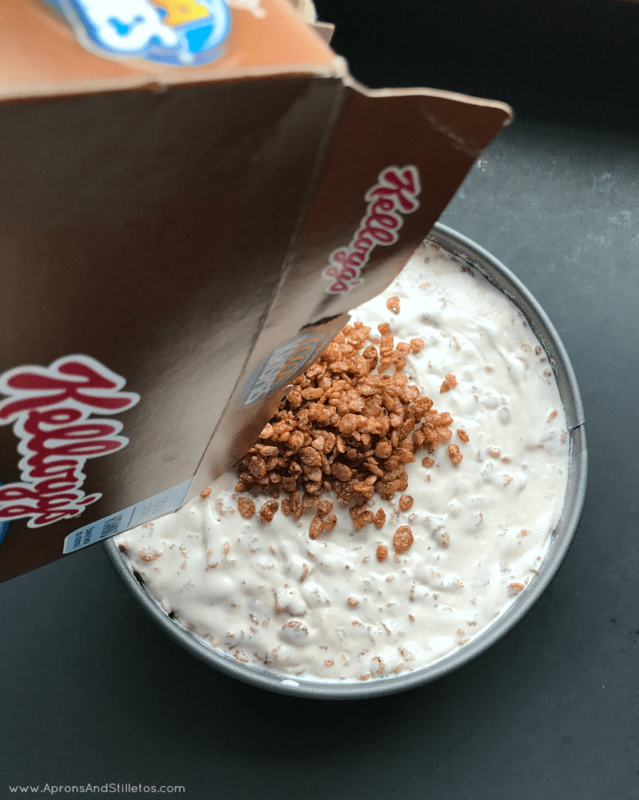 Top the ice cream with remaining 1/2 cup of Kellogg’s Cocoa Krispies Cereal. 6. Cut each Keebler Fudge Stripes Original cookie in half. Spread a little cake frosting on the cut half. Place 7 to 8 cookies around the top edge of the cake. 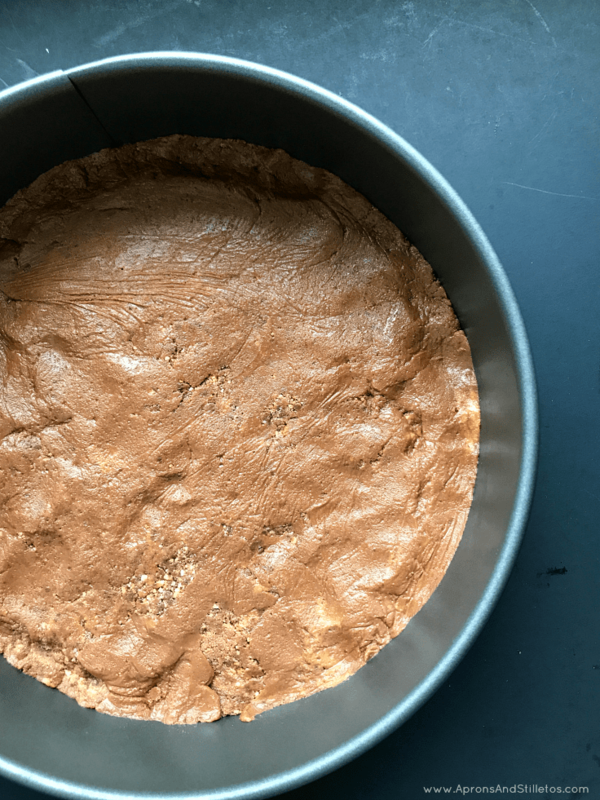 Place the cake into the freezer for 6 hours or overnight. When you take it out, you can enjoy your sweet and crunchy ice cream cake. Everything about it is good. You get the best of every flavor and texture from the soft ice cream to the fudgy crunchy Keebler Fudge Stripes Original cookie on top. 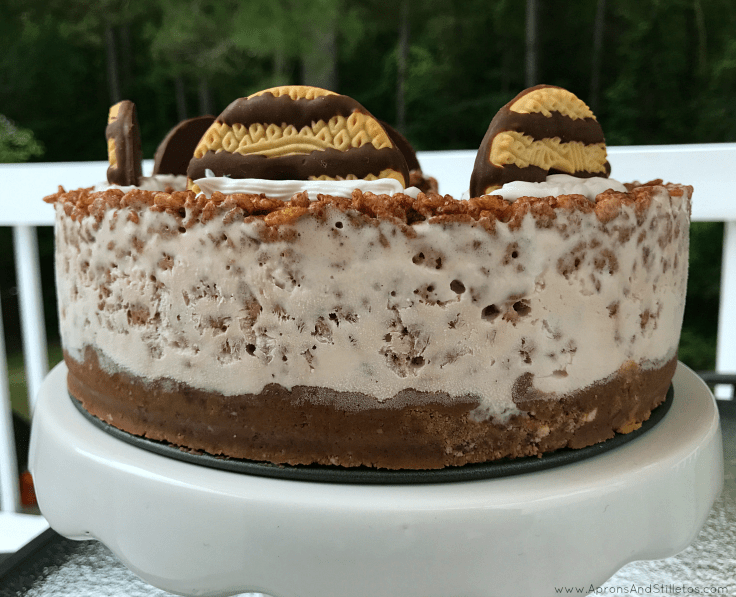 The fudgy, nutty cake crust goes perfect with the crunchy Kellogg’s Cocoa Krispies Cereal filled ice-cream. I hope you and your family enjoy this Triple Layer Fudge Ice Cream Cake as much as we did. That recipe looks really food. I don't think we have Fudge Stripes Original cookies here. I used to eat them all the time when I lived in Florida. Can I just say I am drooling all over the keyboard now. This is such a super dessert idea. My son is having a little cold now, will make this once he's better. Omg I can't! This looks so delicious! I'm going to use this recipe for a party I'm having next week! That cake looks delicious. Thanks for the recipe. Wow that's amazing and creative! I liked the idea of getting a crunch sound in every bite of the cake. So easy to make and looks delish. This looks amazing!! I feel like my friend's kid would love this so I am going to have to give her this recipe so she can try it out. Thank you so much for sharing! The fudge cream cake looks awesome. I know that my daughter would love this. Sounds amazing. Oh my this is awesome. Congrats for your loving effort and I believe your kids love them too. They wont feel sad that school has ended. For the love of yum this looks delicious! Easy enough to throw together to enjoy on a summer weekend too! You can never go wrong with ice cream cake. Then you tell me there are fudge stripes in it?!? You have tempted my taste buds in a great way! This looks amazing. I can't wait to pick up all of the ingredients and make it this summer. Thanks! 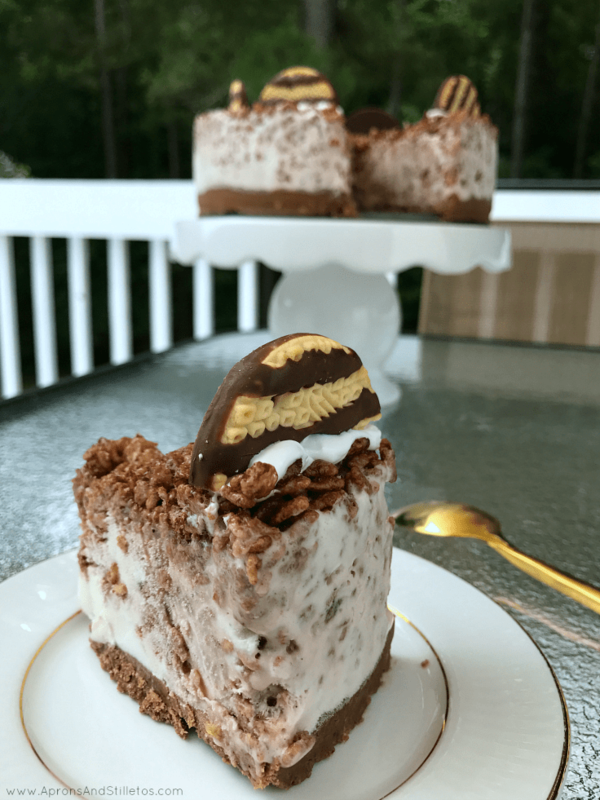 You had me at fudge and ice cream 🙂 Love the idea of making this triple layer fudge ice cream cake for a special occasion or a family BBQ this Summer! This looks so yummy! We have sweet tooth and totally going to try making this. My children is going to love it. Oh so simple! Looks like a great combination of flavors, too! Thanks for the recipe! Ooo my gosh, yes please. I love anything with chocolate, so I'd be happy with this cake, that's for sure. So simple and amazingly delicious looking! I'm not sure Id be able to stop at one slice. Get in my belly!!!! This is the kind of dessert that I like to make, hide and eat all by myself! This would be fun to make and it also looks very tasty! I'm sure my girls would love this. How cool looking is THAT! I'll have to try this one with my nieces and nephews. I'm not sure what aprons has got to do with stillet's but after reading your blog I'm convinced that they work to gather for goos.lol omg that looks so gooooooood. It looks like I'm going to bookmark this to make with my daughter.love it. Thanks dear.